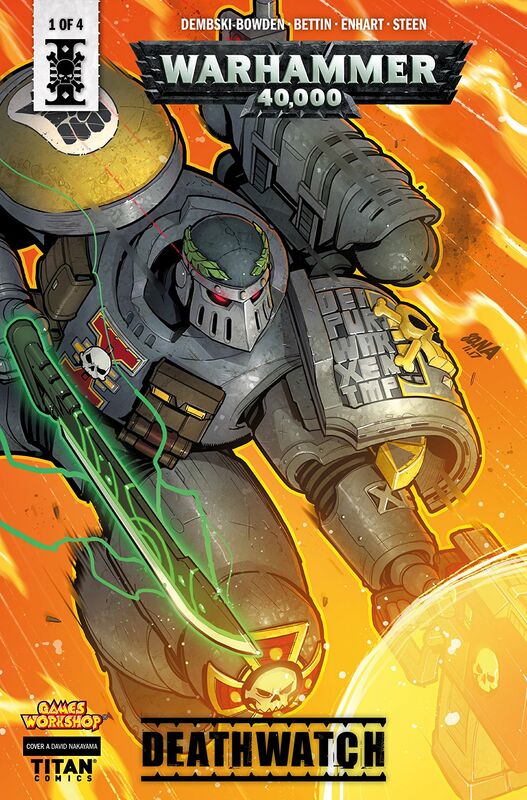 Deathwatch are the best of the best from all chapters of Space Marines! They alone have the strength of mind and body to battle the aliens across the universe defending humanity from the Xenos that would destroy them! Written by Black Library superstar Aaron Dembski-Bowden with artwork from Warhammer fan favorite Tazio Bettin. Stranded and alone at the very edges of the Calaphrax Cluster, on the ore-moon, Sidra, one Deathwatch Kill-Team defends a mining colony from attacking Xenos hordes. If they cannot hold the line, an unstoppable tide will swell and break across the galaxy, leaving untold destruction in its wake. Does this lone Deathwatch team, assaulted on all sides, have the strength to make their final stand? You can pick up all that you need to know about this particular story, set in one tiny, remote corner of the vast Warhammer universe, pretty quickly. 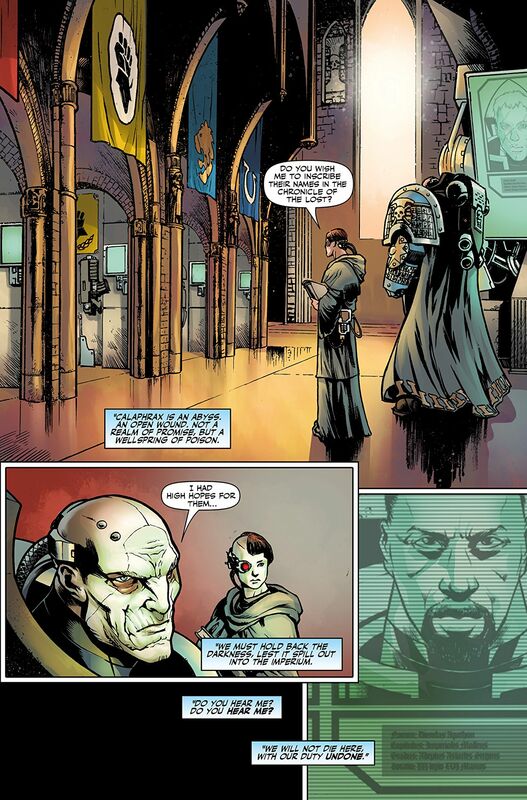 Your main characters are the men of the Deathwatch: Dienekas Agathon, veteran Sergeant of the Imperial Fists; Izrafel, Sanguinary Priest of the Flesh Tearers (sounds friendly, right? ); Kaelar, Codicier of the Celestial Lions; Rurik Warsong, venerable Wolf Guard of the Space Wolves; and finally young Tiberius, Assault Marine of the Ultramarines. There’s a lot of information to be found just in those introductions. First and foremost, religious zealotry is prized more highly than fighting spirit in the world of Warhammer. 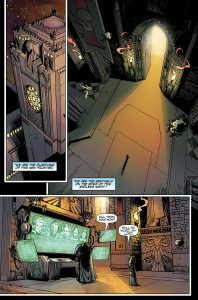 Second, looking at the characters as they’re pictured, you can see as hardened a group of warriors as has ever graced the pages of a book- comic or otherwise. Lastly as we get into the book itself, we’re gifted with the imposing sight of a Space Marine in full combat armor, weapons ready to deal Judgement to the alien menace that is the approaching Xenos Horde. Honestly, I think that’s pretty much all we need to know. With the delivery of those scraps of information, Aaron Dempski-Bowden gets things moving along fairly quickly. The holy warriors of Deathwatch are the tip of the spear (because cowardly heathens carry shields), all that stand in the way of the coming Xenosian invasion. The characters are then each given a moment in the spotlight, their actions speaking to their personalities and commitment more than any detailed intro. These are killers, born and bred, backed by the courage of their Conviction. That’s singular with a capital ‘C’, and Dempski-Bowden lets that laser focus show through in their actions, in the fact that these aren’t ordinary soldiers fighting for hearth and home but for the Salvation of Mankind and the approval of an unforgiving god. If there is one defining factor in all things Warhammer, it’s in the figures of the Space Marines themselves. Giants striding across the battlefields of the galaxy in their suits of powered armor, dealing death with weapons and powers earned through their faith, these are what many readers are really here to see. In both tabletop and video games, the Ultramarines have defined the setting through their impressive visual representations, either in paintable miniature or computer graphic form. 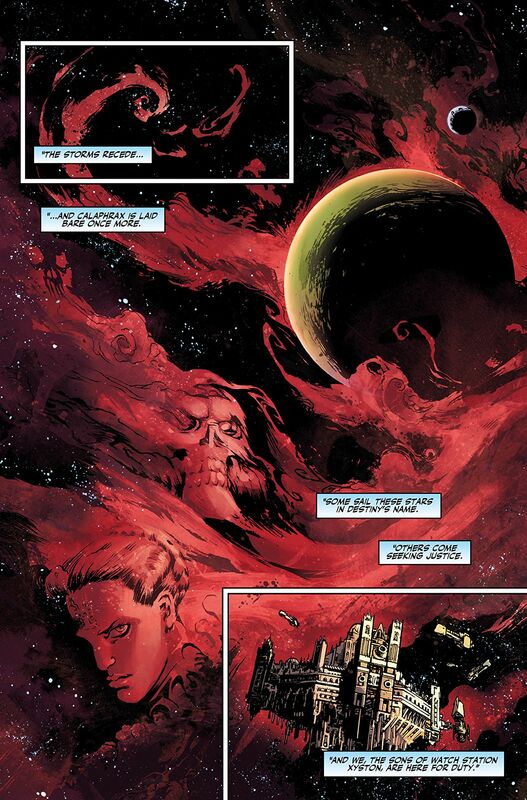 On that front, the team of Tazio Bettin (illustration) and Kevin Enhart (colors) delivers. The combat in this opening issue for the arc is over with fast, but it’s represented on the page with all the brutality you should expect from warriors armed with heavy caliber machine guns and chainsaw-edged battle axes. If there’s a downside to the issue, some might believe it to be in the characters. Keep in mind that it is the first issue and there really isn’t much to go on so far. And to be totally fair, there really isn’t much character growth to be expected when you’re reading about holy warriors with this degree of zealotry. The Marines of Deathwatch wouldn’t even know what a “gray area” is, much less have any interest in walking it. If nothing else, look at this four issue story arc as an introduction into the much larger world of Warhammer. From there, if you think you’d like to learn more, have faith in the fact that there are countless stories to be taken in- I’d like to suggest the novels by Dan Abnett. This is promising to be a high speed, high impact action story. The first issue provided a lone Xenos for the Marines to deal with, and two of them teamed up to put it down. As the invading forces begin their descent in full, anticipate these five brave souls to be facing off against swarms of howling “green skins” (aka: orcs), stepping into the breach with a prayer on their lips and a hym in their hearts.